Offers original designs using basic stitches to create realistic Elvis, Pegasus, unicorn, animal characters and toddler/baby dolls. Offers books for bead crochet purses and amulet bags. Also information on the history of crochet. Dedicated to the art of Filet crochet. Offers an archive of patterns available to paid members, tutorial, message board, free patterns. Offers knit and crochet patterns and books, knitting needles, crochet hooks and accessories. Also free patterns, hook comparison and abbreviations chart. Supplier of knitting and crochet patterns, crochet hooks, knitting needles, yarn winders and various craft accessories. Specializes in graphics-oriented patterns, crochet thread and supplies. Thread crochet bear patterns by Edith Molina, with photos of completed samples. Offers selection of hooks, needles and patterns. Learn to knit and crochet tutorials also available. Offers free patterns, current issue summary, crochet links, and a message board. Offers instructions book on Tunisian crochet, free patterns, and informative articles on different types of stitches and designs. Kateryna Madsen, crocheter and designer. Order crochet patterns (easy but not primitive) or finished crocheted models that are gorgeous and useful. Perfect for gifts. Vintage quilt patterns, embroidery transfers, pillowcase and crochet patterns, feedsack and reproduction fabrics. Offers seamless top-down crochet sweater patterns and kits, including cone yarn. Also free patterns and instruction. Retail and online sales of beading accessories, crochet pattern books, cross stitch and other embroidery patterns and kits, knitting patterns, and needlework software. Australian supplier offering beading accessories, crochet pattern books, cross stitch and other embroidery patterns and kits, knitting patterns, and needlework software. New and used needlecraft books, including crochet, knitting, sewing and doll patterns. Original European style filet designs for doilies, tablecloths and curtains. Also offers tutorials, free patterns, online classes, and books. Specializes in crochet jewelry and patterns. Custom orders are welcome. Offers freeform patterns and gallery of work. New and used older designs, free patterns, and links. Also crochet instructions. Needlework supplies, books and patterns for knitting, crochet and embroidery. Original designs for womens dresses, tops and hats. Specializes in original thread designs for every occasion. Free patterns available. Features a variety of cross stitch, knit, and crochet patterns. Offering sewing, needlework, knitting and crochet patterns by name brands as well as a variety of supplies. Offers handmade Scottish cashmere yarn and patterns for knitting and crochet. If the business hours of Kathleen Early Patterns in may vary on holidays like Valentine’s Day, Washington’s Birthday, St. Patrick’s Day, Easter, Easter eve and Mother’s day. We display standard opening hours and price ranges in our profile site. We recommend to check out kathleenearly.com for further information. 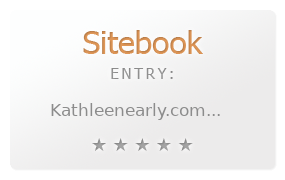 You can also search for Alternatives for kathleenearly.com on our Review Site Sitebook.org All trademarks are the property of their respective owners. If we should delete this entry, please send us a short E-Mail.